Jane Putera passed away on Wednesday at her home in Jamesburg. She was 70 years old. Ms. Putera was born in New Brunswick and graduated from St. Mary’s High School in South Amboy. She was employed by St. Peter’s Grammar School in New Brunswick as a Teachers Assistant prior to working in the New Brunswick Public School System as a Teaching Assistant. 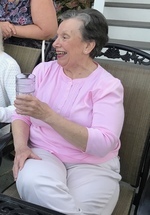 Ms. Putera was predeceased by her father Joseph Putera. She is survived by her daughter Theresa Birdsey of Jamesburg. She is also survived by her mother Elizabeth Putera and her sisters Barbara Gibbons and her husband Tom, Lisa Putera and Stephanie Lanzalotto and her husband Joe, along with 2 nieces, 3 nephews, 3 grand nephews and one grand niece. A funeral mass will take place on Monday, November 5, at 10:30 AM at Holy Trinity Church located at 60 Maple Street in Bridgewater. All other services will take place privately.